A perfect storm is brewing in the French and Austrian Alps this weekend. Also, first look at Eurotunnel’s new freight check-in at Folkestone and DFDS’ new terminal in Dunkirk. Copenhagen looks to remove record cars from the road, at least for one day. Very mixed week for road safety in France. danger spots highlighted on Dutch roads. An ominous combination of half term, a Black Saturday in France and potential snow. Cross-Channel services and Alpine roads will be very busy this weekend as the bulk of schools break up for half term. 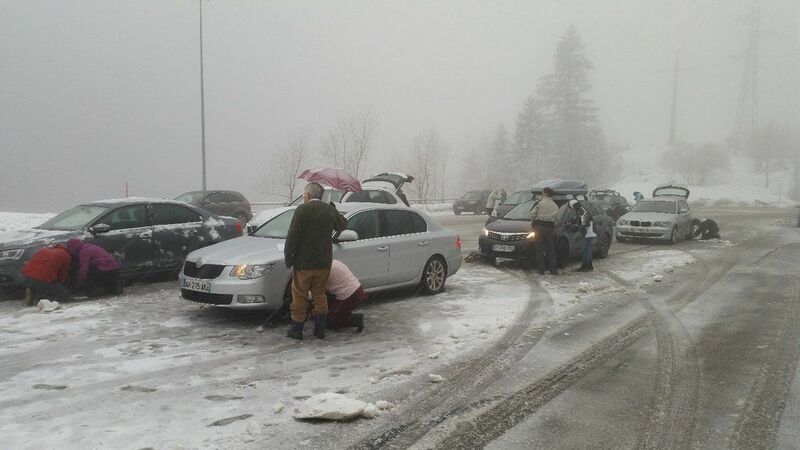 A ‘Black Saturday’ is expected on the roads to the French Alps. While there are no particular warnings for Switzerland or Italy, routes to and from the mountains will be busy in Germany and – particularly – western Austria. Meanwhile, Europe is set for an ‘awful lot of weather’ this weekend according to the BBC, including a bank of rain sweeping in from the west across France which turns to snow in the Alps. Holiday makers should come fully equipped for snow it says, including warm clothes, food, drinks and easily accessible snow chains which drivers know how to fit. The advice from Alpe d’Huez continues, ‘Please give the snowploughs plenty of room to pass through to clear the roads. You are not allowed to overtake them while they are clearing the roads. Police in the Rhone-Alpes region will step up controls this weekend. Cross-Channel services are also expected to be particularly busy. See more on what to expect on the roads, and handy routes to avoid the worst queues in France. Eurotunnel freight cut the ribbon this morning on the new access lanes and check-in at the Folkestone Terminal. In addition to five new access lanes, to separate freight and car shuttle customers (who should stay right), there is also a new ‘Freight Driver’s Centre’ for assistance. Meanwhile, more info has come to light on the new terminal at Dunkirk ahead of the official opening on 17 March. The new facilities came into operation overnight 16-17 January, now with separate entry points for light and heavy vehicles according to Dunkerque Port. There also a new reception for DFDS ferry customers, a specially designed security building and improved routes to the boarding area, which has toilets and a ‘giant’ info screen. The last phase is demolition of the old buildings, freeing up space for three ship-loads of vehicles inside the secure area. roundup: DENMARK. Copenhagen has pencilled in 18 September for its first ever Car-Free Sunday, following similar initiatives in Brussels and Paris (and European Mobility Week). The capital’s main street HC Andersons Boulevard will be off-limits plus other major roads in all city districts reports The Copenhagen Post, though not Frederiksberg to the west of the city centre. Denmark and especially the capital are reckoned as poster boys for alternative transport, particularly bikes, though it was revealed last year there have never been more cars on the roads. FRANCE. A very welcome 10.7% decrease in the number of road deaths last month reports Securite Routiere though it’s not much solace after two tragic accidents this week involving school buses in which eight teenagers were killed. It is however a welcome reverse from December when fatalities increased by 7.7%, and hopefully a good omen for 2016 after two torrid years for road safety. NETHERLANDS. Amsterdam’s A10 ring road is the most dangerous stretch of road in the country reports DutchNews.nl. There were more than 900 accidents there last year due to sheer weight of traffic and frequent junctions says traffic monitor VID. Second worst is the A13 Rotterdam-The Hague and third A20 at Rotterdam. Also watch out for the A58 near Roosendaal, the A20 at Kleinpolderplein and A1/A6 junction near Amsterdam.